From the time the girls were little, they’ve loved to draw. I think that’s pretty normal for children as they envision something and use crayons and markers to bring it to life. Somewhere along the line, many kids move on to other interests and passions and give up on the idea of crafting stories using pictures. A number of years ago, Madison and Kennedy both expressed interest in learning to draw and asked for sketch books as birthday and Christmas gifts. Unbeknownst to us, they were utilizing those books in their rooms when they wanted to decompress. And we have been amazed by how skilled they have come at drawing images with incredible details and for creating beautiful artwork using lettering. They’ve also done well at playing drawing games like Scrawl and Picassimo. 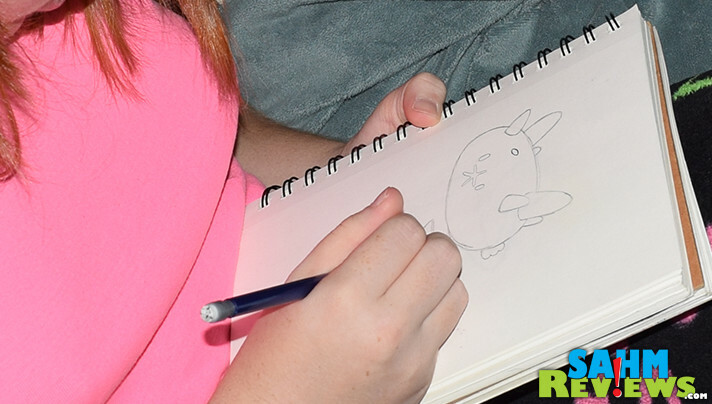 At Gen Con, we discovered Mangaka and Cartooner from Japanime Games to put those skills to the test. 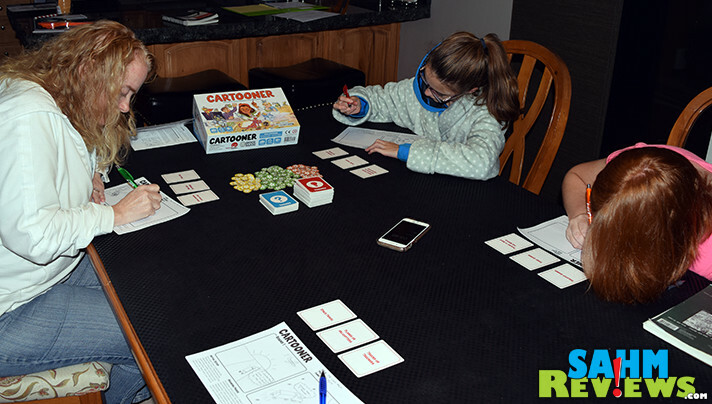 These two are quick-paced games about drawing comic strips. They are virtually identical in rules and components with each containing a different set of cards that are used to inspire the drawings. Over the course of four rounds, you’ll be vying for fame and fortune in the constantly changing market. Don’t worry, neither of these games boil down to who has the most artistic skills or any kind of popularity contest. Seriously, I hate playing those types of games with my girls because it inevitably causes hurt feelings – if not for them, but for me. Thank goodness both Cartooner and Mangaka drawing games utilize a different scoring system to crown the winner. Alas, I’m getting ahead of myself. Let’s talk about the games and how to play. Each round involves three phases: card selection, drawing and scoring. To begin, shuffle the decks of Trend and Theme cards and place them in the center of the table along with the fame tokens. 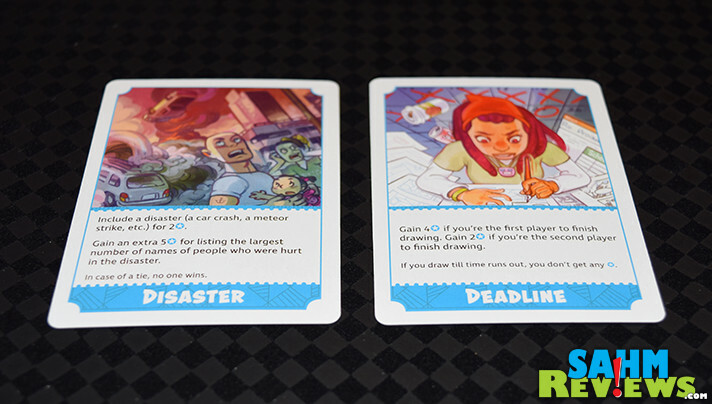 Give each player a set of comic pages and a pencil. Have a phone, stopwatch, egg timer or hourglass available to track the length of the round. You’ll adjust the duration of the round based on the level of difficulty. You may also play music which not only helps you keep track of the time but also to help inspire your work. There are two types of cards: Themes and Trends. Theme cards are drawn at random at the beginning of the first round and stay with you through all four rounds. These are referred to as Obsessions because you’ll be referencing them throughout your story. 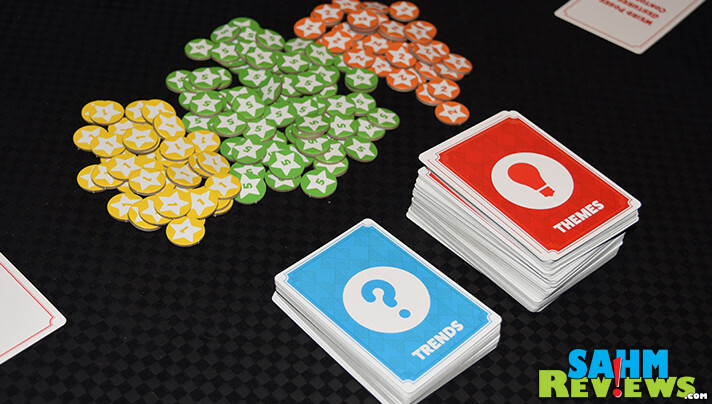 Trend cards enter the game in the second round and they change each round. 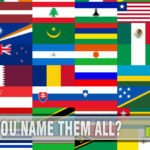 Think of the Themes as the comic’s ongoing storyline or characters while the trends are subject of the latest episode. Trend Cards are also how you earn additional Fame tokens which ultimately are what determines the winner. 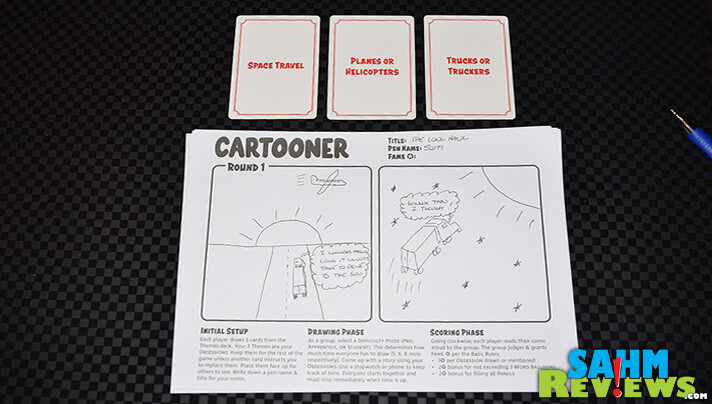 Mangaka and Cartooner are designed to run over four rounds with each getting more detailed. In round one, you’ll create a 2-panel comic. Round 2, 3 and 4 have 4-panel, 6-panel and 8-panel respectively. As I mentioned before, you’ll use the Theme Cards to create continuity between the four rounds in ever-increasing detail while the Trend cards offer diversity as the story progresses. At the beginning of rounds 2-4, a Trendsetter (the person with the lowest Fame) draws a designated number of Trend cards and selects 1 or more depending on the round and difficulty level. Those cards are now the designated Trend Cards for the round and impact all players. 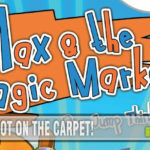 There are three rules to playing Cartooner and Mangaka which will be applied for you to earn Fame tokens. Express your Obsessions each round. Those are the three theme cards I told you about earlier that will carry through the entire game. For each that you include in your drawing, you earn Fame. You’ll earn a Fame token (up to 3 per round) if you’re able to draw them or mention them in a Word Balloon. If you do the math, that means up to 12 across the course of the four rounds. Rule #2 is to draw something in every panel. 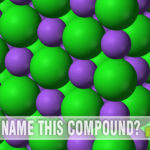 You earn 2 Fame tokens each round if you fill in all the panels for that round. So in order to get the two bonus Fame in round one, you’ll fill in two panels but you’ll have to fill in 8 panels to get them in round four. That doesn’t mean slapping some random scribble in the square, either. When was the last time you saw a random, meaningless scribble in the Sunday comics? Probably never. The third and final rule is to use no more than three Word Balloons each round. Again, you’ll earn 2 Fame tokens each round if you abide by this rule. Sound effects don’t count toward the limit so you can use as many *KaPow” and “Burrrpppp” notations as you like. Same with symbols. Waft those musical notes up into the air above the piano and it doesn’t count toward your three-balloon limit. 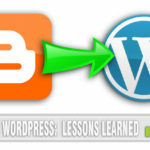 You’ll also earn Fame for successfully completing Trend challenges such as being the first to complete their cartoon or adding specific images into your story. The amount of Fame is designated on each Trend card and varies from card to card. At the end of each round, you’ll read aloud your comic and the rest of the players will assign you Fame based on how well you followed the rules. The winner is the person with the most Fame after all four rounds. 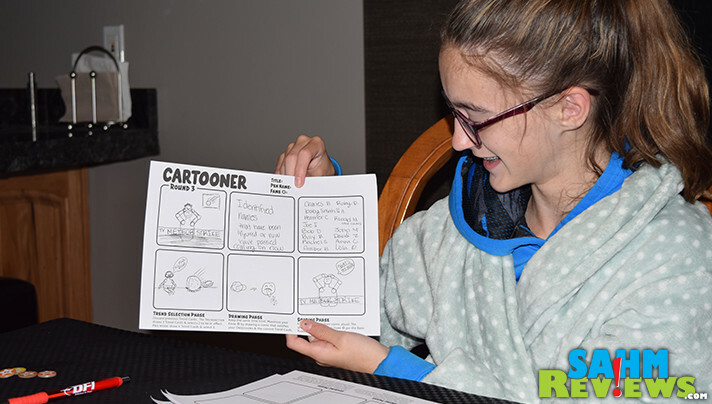 While Mangaka and Cartooner drawing games are great for entertainment, they’re an excellent brainstorming exercise, great for improv practice and awesome as part of a school curriculum. Not only do they incorporate art (duh, it’s drawing) but they also emphasizes writing, reading and grammar. If you add some theatrics while reading your comic at the end of each round, you can also say it requires some skills in public speaking or presentation. You can work solo, play as teams or do a marathon session. So many choices from these two titles with enough cards to give them longevity. You can pick up copies on the Japanime Games website or grab Mangaka for around $32 and Cartooner on Amazon for a bit more. Follow along with them on Twitter and Facebook to see what else is on the drawing board. Do you enjoy drawing comics or would you rather read them? This sounds like such a fun game! My older 2 would really enjoy it I’m sure. They like these types of games. This is one of the coolest games I’ve seen in a while. My niece and nephew love to draw they will absolutely enjoy this. 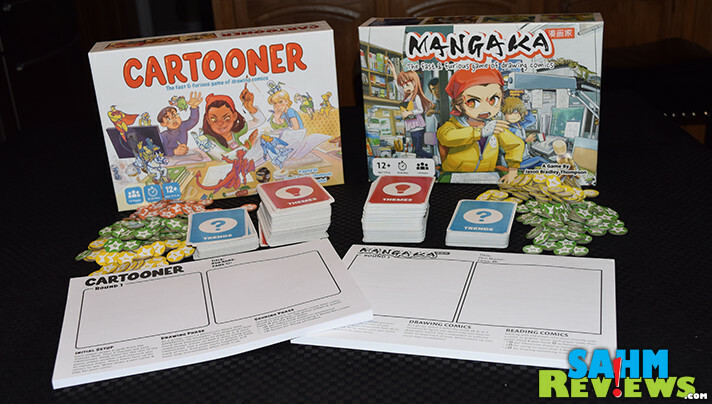 Mangaka and Cartooner sound like great games to play to encourage creativity. I think my nephew would love this as he loves drawing! THis would be a much loved addition in our home. I am glad that you shared this, as usual, you always have such fun family game ideas that I keep adding to my wish list! My brother would enjoy both of these games. He’s been an artist since he was a teen. Yay! I found the perfect gift for my niece! 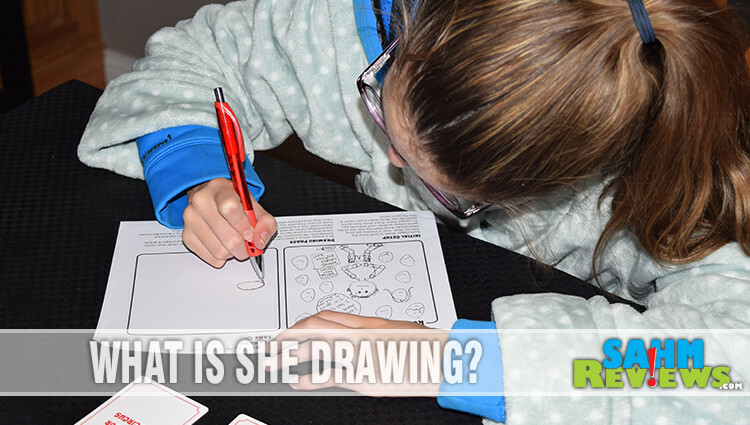 She has such artistic talent and we would love to help her develop that! This game would be such a big help. I think my niece would be really into this. She loves drawing and making her own stories. These look like so much fun. I would have really enjoyed these when I was a kid! Wow, great game for encouraging creativity and fine motor skills! This will be perfect, my granddaughter inherited the natural drawing ability, from my son, who got it from me…..though we both left it by the wayside…….she will love this and just maybe will plant the seed to never let it be set aside.